Get the most out of your exterior space with these welcoming details. 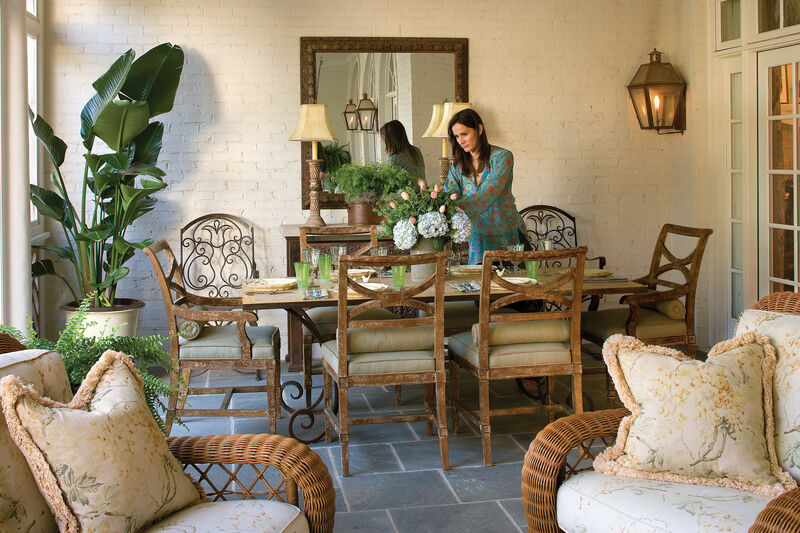 Located in Savannah’s famed historic district, Paula S. Wallace's second-story porch represents outdoor living at its best. With her help, we’ve dissected it, feature by feature, to highlight what makes for the perfect spot to while away some time. Don’t overlook what’s overhead. For Paula’s porch, translucent corrugated roofing secured to double rows of shutters makes an attractive covering. Just like other surfaces, floor materials need to complement your home’s overall style. Here, concrete pavers work well with the brick exterior. “I like to place sofas and chairs at interesting angles to create energy and artful ambience,” Paula says. Colorful throw pillows also add some zip. Decorate your porch with plants. Maintain views by placing larger pots against the walls. Fill in voids with smaller pots of seasonal color for year-round interest. Lamps, mirrors, and accessories placed well under cover further transform your porch into an outdoor room that’s perfect for entertaining and relaxing. Durable floor coverings, like the sisal rug and faux zebra hide above, soften and decorate the porch. For an exposed area, try painting a pattern or color on the floor. Dress up exterior walls with stuff you’d normally see only inside: mirrors with sealed wood or metal frames, artwork like an oil painting from a flea market, and sconces. Having the right style of columns or supports tops the list for making a porch look appropriate. Paula’s porch is supported with a series of simple Tuscan columns.